My father lived an active life of 76 years. There are days when I think of him deeply and feel as though I’ve ‘touched’ him. His life can be seen in a collection of pictures in a box: a young, single man sporting a shotgun; a stern looking father standing behind his children; a rugged outdoorsman proudly displaying a day’s catch; an adored husband; an aging, pensive man, appearing to be planning his next project or adventure. I shuffle through these pictures and for a moment, ‘touch my father’s hand’. I’m surrounded by reminders of my father, keeping alive my memory of him and the times we shared. At my workbench, I hold the tools he left behind and sense the touch of his strong, calloused hand, a hand toughened on the instruments of his trade and his handyman skills: a hammer and hand crafted wooden box, still full of his selection of nails; old hand saws in need of sharpening; chisels and broad knives; a duster that outlived its usefulness as a pure bristle paintbrush. In a storage room, a wallpaper board he gave me warps with age. Always the teacher, I’m sure he was hoping that I was watching and learning some of his decorating skills. I was. I move my hand slowly across its paste stained surface and ‘touch my father’s hand’. Under my desk lies his rifle that we sighted at the range each year in preparation for hunting season. I never saw him shoot a deer. Unlucky, a poor shot, or just a man who enjoyed the woods without the gaming, Now, I feel the cold steel of the tarnished barrel, the etched wood of the worn stock, and the smooth, shiny finish of the trigger, and I ‘touch my father’s hand’. A once classic set of golf clubs stands alone in the corner. We woke early on Saturdays to meet my brothers for a morning of serious, but fun, golf. Good shots were applauded, poor shots were cursed, and loose change went to the winners. Once again, the time together presented him with great teaching moments about golf, life and friendship. Today, I pull a club from the worn golf bag that has stiffened with age, grip it and give it a waggle. Almost seems like Saturday morning. An array of fishing rods lay against the cellar wall. Old reels, pitted by ocean salt, collect dust and spider webs while looking down at me from an overhead shelf. Homemade lures hang by their treble hooks on a nail. I brush away the webs and give one of the reels a crank or two. For a fleeting moment, I see him casting in the foamy, white surf along a sandy Massachusetts beach or rocky Rhode Island shore, places where we fished, side by side. I feel the stiff wire leader run between my fingers, as I close my eyes to a carefree time, a ‘once upon a time’. l have many wonderful memories of my father. I have things of his that depict him and his life. Yet, I don’t have him, anymore. It’s the natural progression of life, isn’t it? But today, when I reached out and held those things that once were his, I ‘touched my father’s hand’…..and it was wonderful, again. This is beautiful – thank you for sharing. It brings back many memories of my father who lived to be 91, rode his bike until he was 90 and tended his vegetable and flower garden until the same age. The tittle is very appropriate. it was very touching.I have some thoughts on my DAD.He worked as a coal miner in Pa.In his spare time he was a cobbler. Fixed many of my shoes.I have the Shoe tree that he worked on. Every now & then I go to the back of the basement to remember him. Thanks, Steve. Sounds like both our dads were hard working men. Thank you for your feedback, Steve. I’m glad you liked it. My father was an artist, and I have many of his pieces that I cherish. I also have his art box with paint brushes and dried up oil paints. Just as you said, holding them is like touching his hand. Thank you for evoking sweet memories. Thank you for enjoying my essay, Ida. I’m so glad that it moved you. While time marches on , it’s still pleasant to hold onto certain memories, especially of folks so close and important to us. 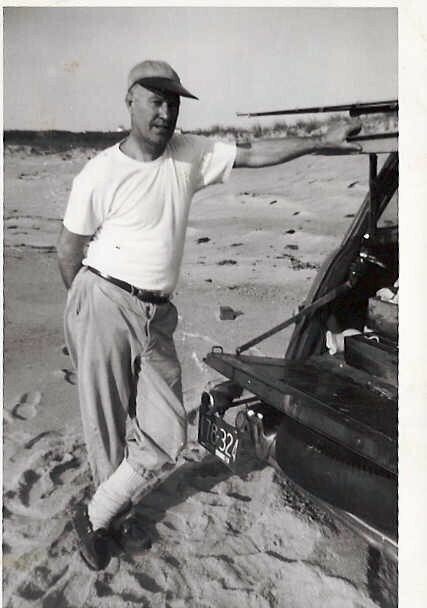 My dad was that kind of man and it sounds like yours was, too. So beautifully put and so nice that even after all these years, you remember him so well and so fondly. I’m sure he would be nothing but honored. This is a very poignant and beautiful tribute to your father, Steve. He sounds like an amazing man. A wonderful tribute to your father, Steve.